Review written by and copyright: Eric Cotenas (16th December 2017). Just released from prison after an eighteen year sentence for killing a man in a dual, Juan Sayago (The Magnificent Seven's Jorge Martínez de Hoyos) returns to his village hoping to start anew. With the promise of a job at the end of his sentence, Juan visits the ranch of Don Diego only to learn from his son Diego Martín Ibáñez (Isle of the Snake People's Quintín Bulnes) that the sons of the man he killed Raul Trueba have sworn vengeance on him and intend to kill him, one of which he meets soon after without either realizing in young Pedro (Satánico Pandemonium's Enrique Rocha) to whom does a kindness. Visiting Mariana (The Book of Stone's Marga López), the woman he once loved who has since married and been widowed with a young son, Sayago digs his heals into the idea of rebuilding his ranch and making up for lost time even as she too warns him of imminent death. Upon learning of Sayago's return, Pedro's older brother Julián (Rio Hondo's Alfredo Leal) tries to challenge the older man into a duel only to be warned off by the sheriff (The Invasion of the Vampires' Tito Junco) who shows Sayago the hospitality of an open jail cell for his own protection. While Pedro finds himself conflicted over the concept of revenge for a father he never knew – especially as evidence and the testimony of his fiancée's father (Claudio Isaac) seem to contradict Julián's insistence that Sayago must have resorted to dirty tricks to best their great marksman father – Julián continues to provoke Sayago despite the warnings of his elders about angering the "bulletproof" Sayago. The directorial debut of Mexico's prolific arthouse director Arturo Ripstein (The Castle of Purity), Time to Die has plenty of pedigree with an original scenario and screenplay by Columbian novelist Gabriel García Márquez (The Invisible Children) with dialogue by Mexican novelist Carlos Fuentes (Queen Doll) and photographed in monochrome by Alex Phillips (Untouched) whose career of over two hundred credits spanned the first fifty-odd years of Mexican cinema, and whose son Álex Phillips Jr. (King Solomon's Mines) would enjoy a similarly prolific forty year career in Mexican and international productions. Although 1966 would seem like the ideal time for Mexico's own take on the spaghetti western, the "Dollars Trilogy" of Sergio Leone would not premiere in America until the following year and even later in Mexico; as such, Time to Die takes its visual cues from Hollywood westerns even as the not-so-much plot as forward momentum of the narrative takes a back seat to the film's thematic concerns. Particularly compelling is the cycle of honor-based violence likened to a recurring curse as Sayago is "haunted" by the same taunts, bullying, and provocations of his victim reenacted unknowingly by the dead man's son. Keeping a shrine to his father's machismo in the locked study, Julián has consigned himself to a sort of monastic existence dedicated solely to revenge, possessing delusions of grandeur of his own while refusing to hear a negative word against his father; and also embodying the contradiction of stating that he is prepared to accept the consequences of his revenge (including death) but flying off the handle when challenged about the image he has built up of his father and warning others to stop before he is not responsible for his actions. Matured in prison, Sayago seems to have become an intermediate figure between men who "don’t run away" – the saddest example being Sayago's old friend Casildo (The Golden Cockerel's Carlos Jordán) whose legs were crushed under a horse and spends shooting targets from his bed to the indulgence of his long-suffering but loving wife (Two Mules for Sister Sara's Hortensia Santoveña) – and the women whose common sense wisdom is ignored like among them Mariana, Pedro's tenacious fiancée Sonia (Blanca Sánchez), or her mother (Five Faces of Woman's Carolina Barret). With his glasses, writing love letters from prison, having taken up knitting, and being willing to admit that he is as afraid of dying as he is of killing, Sayago seems to have matured emotionally as well as physically but eventually he too places honor above his second chance at happiness and seemingly expecting that loved ones will accept the hurt he and Julián are about to bring as part of life. That the duel finale is anticlimactic is appropriate in that it vindicates no one and brings about further tragedy, while the Christ-like collapse of one character in death seems more like an affection of the filmmaker than the writers. While short on western genre action, the film is engaging in its performances and its tragic melodramatics; so much so that – as filmmaker Alex Cox (Repo Man) enthuses in the Blu-ray video introduction – it would be interesting to see what Ripstein take on the genre again. The film was remade as both a 1984 telefilm and 1985 feature using the same Márquez script and Fuentes dialogue by Jorge Alí Triana (Bolivar is Me). Unreleased in the United States theatrically and unavailable on home video apart from unsubtitled tapes and a DVD aimed at the North American Spanish-speaking market, A Time to Die gets a 2K high definition restoration that is a surprisingly crisp and clear given what one has come to believe about the state of Mexican film preservation (although presumably the negative for this was stored at Estudio Churubusco's labs). Grain remains well-defined and there is little to no damage with even the opening and closing opticals looking quite clean. The sole audio option is a clean LPCM 2.0 Spanish mono track of a rather basic sound mix of post-synchronized dialogue and sparse sound effects suited to the desolate setting. Optional English subtitles are free of errors. Extras start off with a video introduction by filmmaker Alex Cox (6:51) who has previously written on and provided commentaries and interviews on spaghetti westerns but speaks from a more personal stance about his relationship with Ripstein during the period in the nineties when he was making films in Mexico - Cox would appear in Ripstein's La Reina de la Noche - and discusses how Ripstein's style and technique has evolved from Time to Die (which he suggests Ripstein holds in low regard as a directorial debut since he had come off of assisting Luis Buñuel on Exterminating Angel). 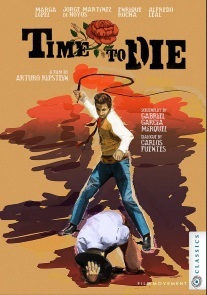 Next up is an audio commentary by Arturo Ripstein and Enrique Rocha in Spanish with optional English subtitles in which Ripstein recalls meeting Márquez through star de Hoyos who wanted them to write a script for him, and that Fuentes was on hand to translate the Márquez's Columbian Spanish into the Mexican dialect. He also discusses his preference for two-shots over close-ups (used sparingly for emphasis) and plan-séquence. Rocha recalls that Ripstein asked him for advice as a stage performer on directing actors during pre-production but was more confident when shooting started. The disc also includes the film's theatrical trailer (1:53) and bonus trailers, while a booklet with an essay by Carlos A. Gutièrrez is included in the case.